This is delicious with cooked small octopus, cooled and cut into 1/2-inch pieces, mixed with the clams before the tangy broth is poured over. Soak the clams for 20 to 30 minutes in fresh water, then lift them out of the water (leaving behind any expelled sand). Scrub the clams. Melt the butter in a large (4-quart) pot. Add the garlic and green chile, stir 1 minute, then add the chicken broth and beer. When it comes to a boil, add the clams, cover tightly and set over high heat. Cook just until the clams have opened, usually about 3 minutes. Remove the clams, dividing them between four serving bowls. Return the pot to high heat, and boil until reduced to half its original volume. Remove from the heat, cool a couple of minutes, then add the lime juice and cilantro. Taste and season with salt if necessary. 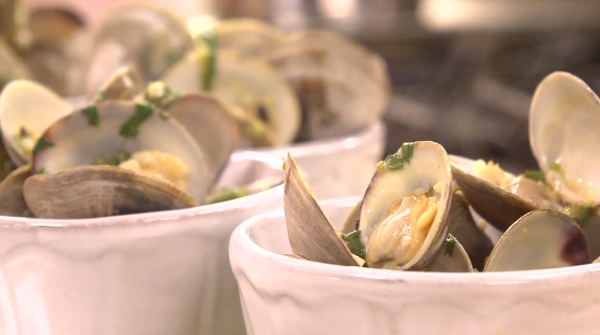 Pour the tangy broth over the clams and serve.